Blue Mountain Bund Youth Hostel is centrally located near East Nanjing Road metro station, 'just five minutes' walk from Nanjing Road and ten minutes away from the Bund'. Our guests say this means it's 'near enough everything to be easy but quiet at night'. 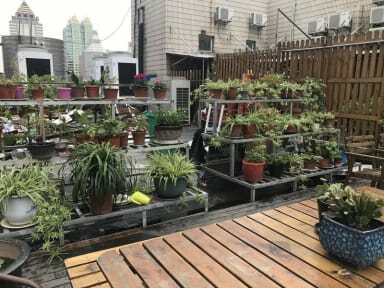 The hostel features 'a cool roof terrace...[which is] nice for drinking and playing a bit of pool', while some rooms have 'a very nice view over Shanghai', according to our visitors. We’re five minutes’ walk from East Nanjing Rd and 15 minutes from the Bund; what more can you ask for?! Besides, you can get to Old Town or Xintiandi or any other places you want to go by metro conveniently from the East Nanjing Rd metro station, which is just 300m from our hostel. Our hostel provides you home-like feeling with cosy rooms, customised beds and friendly staff, just like our other two Blue Mountain hostels have been doing all this time. We have 24hr hot water and air conditioning to ensure that your stay is enjoyable. You can even enjoy the beauty of Suzhou Creek in the evening from the private balcony of our deluxe standard room. Some of our private rooms (and all of our triple rooms) have no windows. We offer free Internet access in all our standard rooms and free wi-fi access in our hostel bar. There’s also free movies, pool games, free books, board games and table football. It is always full of fun! Also, you will find that nothing is better than chatting with other travellers on the giant sightseeing platform with beer or a cup of our professional hand-made coffee in your hands. Great place to stay. I unfortunately was there when a pipe broke and flooded the floor in front of the bathrooms. It wasn't a horrible flooding, but just something I wouldn't be able to give a full 10 for the stay. If that didn't happen, they would have had a full 10 for sure. Super friendly staff and a great location. Got locked out of the room at 6am because the keycard stopped working (this also happened to my friend) but other than that an easy stay. Nice, clean bathrooms with hot showers. Could have done with more signposting outside as we had no clue where it was! Had a 18h layover in shanghai and came here to spend the night. Its cheap and very close to the Shanghai bund, which I could thankfully visit during the short stay! Nice stay, not much more than that. My biggest problem was the design of the hostel: the common area was right next to the rooms and the noise was terrible. Location is nice, less than 5 minutes walk to a metro station. Staff is very nice, but their English isn't the best. They have very good optional breakfasts. Location was ok but a bit hard to find as there are not a lot of signs telling you your at the building! Check in was easy and our room was big enough and big lockers for our big bags which was very handy! However 2 Chinese people in our room kept coming and going all night!!! Could hear them spitting in the bathroom from our room! Not pleasant! Location is good. Slightly difficult to find, in a tower block. I didn't spend much time in the hostel as there is so much to see and do in Shanghai but the facilities were good. My room was right next to the common area and therefore was noisy, music was played till midnight. I think what puts our hostel ahead of the rest is our location in the real centre of the city, as well as our friendly and helpful staff. We've got a huge rooftop area with a beautiful view of the Suzhou creek, too. We're less than 15 minutes from People's Square and Old Town and just five minutes from East Nanjing Road. Personally I recommend people definitely visit the Bund.